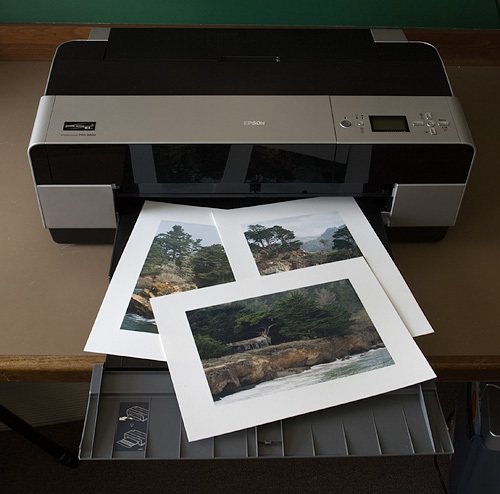 The purpose of this page is to help photographers who are considering purchasing the Epson 3800 and also to help existing 3800 users get the most from this printer. If you have tips to contribute or have questions not covered here, please let me know! March 23, 2011 I have created ABW profiles for Canson Infinity Platine Fibre Rag, for both the Epson 3800 and Epson 3880 printers. Enjoy! April 12, 2010 I have created ABW profiles for Canson Infinity Baryta Photographique and Hahnemühle Fine Art Pearl, for both the Epson 3800 and Epson 3880 printers. Thanks to W. Walker and L. Watson for providing paper samples. February 21, 2010 I have added Epson 3880 ABW profiles for Crane Museo Silver Rag to the 3880 ABW profiles page. Thanks to A. Goldhammer for submitting the paper samples. February 13, 2010 I have begun building ABW profiles for the Epson 3880 printer. Due to the different ink sets, screening technology, and driver behavior between the 3800 and 3880, ABW profiles for these two printers are necessarily different: that is, an ABW profile for one printer will generally not work well for the other. For now, I just have a handful ready for the 3880 (not nearly as many as I do for the 3800), but over time I hope to expand the list. December 28, 2009 I have added ABW profiles for the Epson Hot Press Bright and PremierArt Generations Alise Bright White papers to my ABW profiles page for the Epson 3800. September 13, 2009 I have added ABW profiles for Crane Museo Silver Rag and Inkpress Baryta Warm Tone to the ABW profiles page. Thanks to A. Goldhammer and N. Goodman for submitting the paper samples. September 1, 2009 Epson has announced the Epson Stylus Pro 3880, the follow-up model to the Epson 3800. As I recall, the original 3800 shipped in early September 2006, so it is fitting and expected that a successor would appear three full years later. Not surprisingly, the 3880 looks rather similar to the 3800. I believe that, in design and operation, it is very much the same. The primary differences are in the internals: (1) the adoption of the UltraChrome K3 with Vivid Magenta inks (whereas the 3800 used the UltraChrome K3 -- no Vivid Magenta), and (2) newer screening technology. I am actually more interested in the latter. I have seen the results from other Epson models that possess this newer tech (like the R2880) and found them superior to what the original 3800 could produce on Photo Black-compatible papers, particularly in saturated yellow-green areas and red-magenta areas. June 20, 2009 I have added an ABW profile for Ilford Smooth Pearl to the ABW profiles page. Thanks to R. Graham for submitting the paper samples. May 16, 2009 I added two new entries to the FAQ. Steps for printing from Adobe Lightroom. Screenshots that show how to configure the Epson driver on the Mac. January 10, 2009 I have added an ABW profile for Hahnemühle Photo Rag Bright White 310 to the ABW profiles page. Thanks to M. Clayton for the paper samples. November 11, 2008 Due to popular demand, I have added ABW profiles for Epson Premium Luster and Hahnemühle Photo Rag Baryta 315 to the ABW profiles page. August 30, 2008 I have added ABW profiles for Epson UltraSmooth Fine Art 325 and Innova Soft White Cotton 280 to the ABW profiles page. Thanks to C. Meylan for the Innova samples. August 16, 2008 I have added ABW profiles for Hahnemühle Fine Art Baryta 325 and Hahnemühle William Turner to the ABW profiles page. Thanks to P. Shankar and G. DeWolfe for supplying paper samples. Mark D. Segal has written an article about 3800 ink costs. Mark finds that ink overhead (i.e., ink used for maintenance and other non-printing tasks) is about 20% of ink used for prints. To quote directly from the article, "Hence on average, the cost of ink for a print should be multiplied by about 1.2 to take account of losses." I originally estimated (much less carefully than Mark) around 2 mL of total ink used per square foot of printed area. Mark is finding ink usage to be roughly 1.7 mL of total ink used for the same area (I'm deriving this number from his non-Yellowstone data). Once you multiply 1.7 by 1.2 (the overhead factor), you get pretty close to 2 mL per square foot. January 19, 2008 I have added ABW profiles for Hahnemühle Photo Rag Pearl 320 and Ilford Gold Fibre Silk 310 to the ABW profiles page. November 11, 2007 I have added a 3800 ABW gray profile for Epson Exhibition Fiber to my ABW profiles page. I have done some preliminary testing of Epson Exhibition Fiber (EEF) on letter-sized sample sheets on my 3800 with the K3 inks. D-max is about 2.2 when printing with the standard RGB color driver and jumps up to 2.5 when printing with the ABW driver. In both cases I used the Premium Luster Media Type and 2880 dpi. Additional density could probably be achieved with the RGB driver by increasing the Color Density to +10, but I did not try this. Appearance-wise, EEF reminds me very closely of Innova FibaPrint Ultra Smooth Gloss 285. The paper white and surface characteristics are nearly indistinguishable. However, EEF has a slightly thicker base -- a good thing in my book. It's also possible that EEF has a different coating (not sure about this). I compared EEF closely to Harman Gloss FB Al, another recent fiber inkjet paper. EEF has a slightly cooler and brighter base than HG. Thus when placed side by side, EEF looks whiter and HG is warmer and dimmer. HG's surface is noticeably smoother, leading to a more pronounced gloss effect. In contrast, EEF's surface has a bit more texture or tooth to it, breaking up the mirror-like gloss effect. Fortunately, EEF does not have the "sparkly" or "pebbly" effect of luster papers such as Premium Luster. EEF is ever so slightly thicker than HG; I have no trouble feeding either EEF or HG through the Auto Sheet Feed, but I do so one sheet at a time (to prevent misfeeds). In terms of surface characteristics and hand-feel, I don't currently have a strong preference one way or another. In practice, I think it would boil down to the image in question. Printing quality between the two is very similar: outstanding. A significant characteristic of HG is how tightly it holds the ink drops: it has a very tight dot pattern which preserves super-fine detail better than any other inkjet paper I've tried (with perhaps the exception of Pictorico High-Gloss White Film). Very sharp. EEF is not quite as sharp as HG, but close. Whether the difference is due to the Baryta layer in the HG, I have no idea. But there's a tradeoff, which is that for small prints which are viewed up close, the dot pattern on the HG is more easily discernible to the naked eye. In other words, smooth areas on HG can be very slightly grainy, more so for color prints than for B&W. In comparison, these flat areas on EF appear very smooth. The EEF and HG papers are very close when it comes to gloss differential. These are probably the best two on the market I've yet seen in terms of minimal gloss differential when used with the K3 pigment inks, especially for B&W prints. For color the gloss differential is more noticeable, but these two papers are still better than the rest. The new Vivid Magenta inks are supposed to help reduce gloss differential even more, but by how much I cannot say (I haven't done a personal comparison). An important note: the Epson info sheet that came with the EEF samples suggests using the Front Feed to load the paper on the 3800. Don't do this!! The print head ends up too far from the paper surface, so the ink dots misregister and end up causing a "ghosting" image — very fuzzy. If you would like to use the Front Feed (e.g., to avoid pizza wheel marks entirely) then try this method described here. October 8, 2007 There is a new paper from Epson called Exhibition Fiber. It is Epson's first entry in the F surface inkjet paper market and is planned for release in November. Click here to read a preview by Michael Reichmann. I look forward to trying this paper with the 3800. I have written a page describing my current favorite papers for the Epson 3800. Instead of using gray curves when printing with the ABW driver, I have now moved on to building and using standard ICC profiles for the ABW driver. The new method retains all the benefits of the older gray curve approach described on this page, shares the same workflow as when printing color images, and can be used from all printing applications (such as Lightroom), not just Photoshop. I have written some notes and example plots on color gamuts. Note that if you print from Lightroom, the new driver may also invalidate your existing Lightroom printing presets. At this point I don't see any practical reason to update to driver version 6.5a. April 22, 2007 I have written an article that provides step-by-step instructions for printing color and B&W images on the Epson 3800. The article also contains tips for display calibration and soft-proofing. This is practical how-to article; it doesn't really cover the theory. I hope the article will help new 3800 users achieve better screen-to-print matches. The advice given in the article should also help photographers who own different printers, though the exact steps may differ somewhat. April 21, 2007 I updated the article on reading big profile targets with the following note: when reading targets in MeasureTool in the "Strip with Gaps" mode, you must read each strip from left-to-right only, not right-to-left. Otherwise, the measurements will be reversed and you'll end up with a bogus profile. April 14, 2007 I have added ABW gray curves for five Red River papers to the papers page: UltraPro Gloss, UltraPro Satin, Aurora Art White, Aurora Art Natural, and Dourian Art. April 4, 2007 I have written a new article that explains how to build printer profiles in MonacoPROFILER using measurement data obtained in MeasureTool (e.g., with an Eye-One Pro). I have provided a free Windows-only program called ConvertToMonacoLAB which performs the required measurement conversion. Bill Atkinson provides a similar Mac-only program. March 27, 2007 Added ABW gray curves for three papers: Epson Ultra Premium Presentation Paper Matte (formerly Enhanced Matte), Innova FibaPrint White Gloss (F-Type), and Moab Entrada Fine Art Natural. March 23, 2007 I have been experimenting with building my own gray curves for printing black and white images the ABW driver. These paper-specific curves are designed to reproduce tones accurately throughout the entire range from shadows to highlights. They also provide a way to soft proof images (at least for judging tonal relationships). Things are still in the experimental stage, and I've only done a few tests so far (about 20 prints), but the results are pretty good. I've written an article explaining the process and have made my gray curves freely available on this page. There are only a few curves right now, but I plan to add more as I work with more papers. If you would like to obtain curves for specific papers that I haven't tried yet, let me know and perhaps we can work something out. Note that there are many other black and white printing solutions, including Roy Harrington's excellent QuadToneRIP, which offers a much higher degree of control and flexibility (Roy recently added Epson 3800 driver support to QTR). On the other hand, the gray curves described here might come in handy if you prefer to print from Photoshop (instead of a separate application) or use the ABW driver (instead of the color RGB driver). March 21, 2007 Ethernet Port Firmware Update v1.01 has been posted to the Epson USA support site. According to the release notes: This update allows you to correctly reset the printer after a print job is canceled when using the Ethernet connection. To apply this firmware update, please use the Remote Panel Utility or the Firmware Update selection in the EpsonNet Config Utility, also downloadable from this page. Note that this is an ethernet port firmware update only -- not a general printer firmware update. March 7, 2007 Welcome to my Epson 3800 tips and resources page! It's taken a while to put it together, and I hope it will help both prospective and existing 3800 users. According to the Epson USA support site, the latest firmware for the 3800 is o00573 (posted May 24, 2007). See here to learn how to interpret the firmware numbers. There are no image quality changes. If you have existing custom profiles, you can continue to use those profiles with the new firmware. The new firmware resolves an issue where the Print Watcher utility causes the 3800's print head to not cap itself properly when the print head is parked, leading to clogged nozzles. The latest driver version for Mac OS X (Leopard) is available from the Epson USA support site. The driver version number is 3.57 for Tiger and 6.11 for Leopard. The latest driver version for Windows is 6.50 and is available from the Epson USA support site.